Agricultural products of many kinds can be made into alcohol. The choice is not merely a matter of which ones have the greatest yield, but also a question of economics. Since the cost of gasoline isn't yet as high as world market price, the choice of raw material for alcohol fuel must be determined on the basis of production cost, the selling price of the raw product, and the type of farm machinery the farmer has. Naturally, spoiled grains, vegetables, and fruits at a haul-away price would be best, but they are not always a dependable source of supply. A farmer growing his own raw material would select his alcohol crop for the highest yield of starch or sugar. Right now, sugar beets seem an ideal product to turn into alcohol, as sugar beet prices are so low that many sugar refineries are closing their doors. And sugar beets give a high alcohol-per-acre yield. Corn is on the fence: At $2.50 a bushel, it would be a good deal for the farmer to turn his crop into alcohol and use the distiller's feeds for his own livestock ... but if the price climbs above $3.00 a bushel, then some figuring with a sharp pencil is in order. The price of gasoline is also a determining factor. As gas prices continue upward, the prospect of turning agricultural crops into fuel is the better deal, if crop prices remain depressed. But using food crops for fuel is a short-term idea. As progress is made in understanding and using the enzymatic process, more waste material will be turned into alcohol fuel. Waste forest material, garbage, sewage, and crop residue can and will be converted to fermentable sugars. Marginal lands can grow special plants -- such as Jerusalem artichokes, kudzu, and others -- where regular food crops cannot produce a profit for the farmer. Right now, production of enzymes for converting cellulose to sugars is only in the development stage, but it is expected that within a few years something will be available to small alcohol-fuel producers. Until cellulose enzymes are cheaper, however, the farmer will have to decide pragmatically which crops to plant for his alcohol fuel. Reprinted from Small Scale Fuel Alcohol Production. The United States Department of Agriculture, Washington, D.C. 20250. Ethanol may be produced from a variety of farm crops and wastes. The suitability of each type of feedstock may be assessed in terms of its calculated yield of ethanol, its availability by season and region of the U.S., and its cost. Feedstock suitable for use in ethanol production via fermentation must contain sugars, starches, or cellulose that may readily be convertible to fermentable sugars. Feedstocks can be classified roughly into three groups: those containing predominantly sugars, starches, or cellulose, as shown below. The fermentation and distillation processes for two of the feedstock types, starch and sugar, are essentially identical. Their variations occur in storage requirements for the feedstock, the preparation of the fermentable sugar from the raw feedstock, and the" type of by-product produced. The type of feedstock used has implications both for feedstock storage and in length of time during the year that an ethanol production plant could reasonably be expected to operate. Storage of any of the small grains would be the same whether they were to be used for feed or for alcohol production, i.e., moisture content, etc. would need to be controlled in order to prevent deterioration. Sweet sorghum, sugar cane, and sugar beets have a short storage life in their harvest form. Traditionally, the sugar industry has extended its processing season by extracting and storing the sugars in the form of molasses. The storage life of the feedstock is then considerably lengthened. Potatoes have approximately a six-month storage period prior to the start of any significant deterioration in their sugar/starch content. Overripe or damaged fruits have an extremely short storage life and need to be processed quickly. However, alcohol production from these materials aids in alleviating their disposal problem. Preparation is basically a crushing and extraction of the sugars which the yeast can immediately use. But sugar crops must be dealt with fairly quickly before their high sugar and water content causes spoilage. Because of the danger of such spoilage, the storage of sugar crops is not practical. Sugar Cane. At the present time only 4 states (Florida, Louisiana, Texas, and Hawaii) cultivate sugar cane, but there are hybrids (such as saccharum spontaneum) which can be grown further north. High yields per acre of both sugar and crop residue are strong points of sugar cane production. The crop residue, called bagasse, is used in Brazil to provide heat for the distilleries. Sugar Beets. Although sugar beets are grown in many areas of the U.S., they must be rotated with nonroot crops (1 beet crop per 4 year period is the general rule). While beet by-products cannot provide fuel for the distillery, the beet pulp and tops are excellent feed in wet or dry form. Or the tops may be left on the field for fertilizer and erosion control. Excerpted directly from Fuel from Farms -- A Guide to Small-Scale Ethanol Production. United States Department of Energy, Washington, D.C. 20545. Any references to other parts of the text pertain to Fuel from Farms, not to this manual. Interest in ethanol production from agricultural crops has prompted research on the development of sugar crops that have not been cultivated on a widespread commercial basis in this country. Three of the principal crops now under investigation are sweet sorghum, Jerusalem artichokes, and fodder beets. Sweet Sorghum. Sweet sorghum is a name given to varieties of a species of sorghum: Sorghum bicolor. This crop has been cultivated on a small scale in the past for production of table syrup, but other varieties can be grown for production of sugar. The most common types of sorghum species are those used for production of grain. There are two advantages of sweet sorghum over sugar cane: its great tolerance to a wide range of climatic and soil conditions, and its relatively high yield of ethanol per acre. In addition, the plant can be harvested in three ways: (1) the whole plant can be harvested and stored in its entirety; (2) it can be cut into short lengths (about 4 inches long) when juice extraction is carried out immediately; and (3) it can be harvested and chopped for ensilage. Since many varieties of sweet sorghum bear significant quantities of grain (milo), the harvesting procedure will have to take this fact into account. Jerusalem Artichokes. The Jerusalem artichoke has shown excellent potential as an alternative sugar crop. A member of the sunflower family, this crop is native to North America and well-adapted to northern climates . Like the sugar beet, the Jerusalem artichoke produces sugar in the top growth and stores it in the roots and tuber. It can grow in a variety of soils, and it is not demanding of soil fertility. The Jerusalem artichoke is a perennial; small tubers left in the field will produce the next season's crop, so no plowing or seeding is necessary. Although the Jerusalem artichoke traditionally has been grown for the tuber, an alternative to harvesting the tuber does exist. It has been noted that the majority of the sugar produced in the leaves does not enter the tuber until the plant has nearly reached the end of its productive life . Thus, it may be possible to harvest the Jerusalem artichoke when the sugar content in the stalk reaches a maximum, thereby avoiding harvesting the tuber. In this case, the harvesting equipment and procedures are essentially the same as for harvesting sweet sorghum or corn for ensilage. Fodder Beets. Another promising sugar crop which presently is being developed in New Zealand is the fodder beet. The fodder beet is a high yielding forage crop obtained by crossing two other beet species, sugar beets and mangolds. It is similar in most agronomic respects to sugar beets. The attraction of this crop lies in its higher yield of fermentable sugars per acre relative to sugar beets and its comparatively high resistance to loss of fermentable sugars during storage . Culture of fodder beets is also less demanding than sugar beets. Fruit Crops. Fruit crops (e.g., grapes, apricots, peaches, and pears) are another type of feedstock in the sugar crop category. Typically, fruit crops such as grapes are used as the feedstock in wine production. These crops are not likely to be used as feedstocks for production of fuel-grade ethanol because of their high market value for direct human consumption. However, the coproducts of processing fruit crops are likely to be used as feedstocks because fermentation is an economical method for reducing the potential environmental impact of untreated wastes containing fermentable sugars. In starch crops, most of the six-carbon sugar units are linked together in long, branched chains (called starch). Yeast cannot use these chains to produce ethanol. The starch chains must be broken down into individual six- carbon units or groups of two units. The starch conversion process, described in the previous chapter, is relatively simple because the bonds in the starch chain can be broken in an inexpensive manner by the use of heat and enzymes, or by a mild acid solution. From the standpoint of ethanol production, the long, branched chain arrangement of six-carbon sugar units in starch crops has advantages and disadvantages. The principal disadvantage is the additional equipment, labor, and energy costs associated with breaking down the chain so that the individual sugar units can be used by the yeast. However, this cost is not very large in relation to all of the other costs involved in ethanol production. The principal advantage in starch crops is the relative ease with which these crops can be stored, with minimal loss of the fermentable portion. Ease of storage is related to the fact that a conversion step is needed prior to fermentation: many microorganisms, including yeast, can utilize individual or small groups of sugar units, but not long chains. Some microorganisms present in the environment produce the enzymes needed to break up the chains, but unless certain conditions (such as moisture, temperature, and pH) are just right, the rate of conversion is very slow. When crops and other feeds are dried to about 12% moisture -- the percentage at which most microorganisms cannot survive -- the deterioration of starch and other valuable components (for example, protein and fats) is minimal. There are basically two subcategories of starch crops: grains (e.g., corn, sorghum, wheat, and barley) and tubers (e.g., potatoes and sweet potatoes). The production of beverage-grade ethanol from both types of starch crops is a well established practice. Much of the current agronomic research on optimizing the production of ethanol and livestock feed from agricultural crops is focused on unconventional sugar crops such as sweet sorghum. However, opportunities also exist for selecting new varieties of grains and tubers that produce more ethanol per acre. For example, when selecting a wheat variety, protein content is usually emphasized. However, for ethanol production, high starch content is desired. It is well known that wheat varieties with lower protein content and higher starch content usually produce more grain per acre and, consequently, produce more ethanol per acre. The "backbone" of sugar and starch crops -- the stalks and leaves -- is composed mainly of cellulose. The individual six-carbon sugar units in cellulose are linked together in extremely long chains by a stronger chemical bond than exists in starch. As with starch, cellulose must be broken down into sugar units before it can be used by yeast to make ethanol. However, the breaking of the cellulose bonds is much more complex and costly than the breaking of the starch bonds. Breaking the cellulose into individual sugar units is complicated by the presence of lignin, a complex compound surrounding cellulose, which is even more resistant than cellulose to enzymatic or acidic pretreatment. Because of the high cost of converting liquefied cellulose into fermentable sugars, agricultural residues (as well as other crops having a high percentage of cellulose) are not yet a practical feedstock source for small ethanol plants. Current research may result in feasible cellulosic conversion processes in the future. Forage crops (e.g., forage sorghum, Sudan grass) hold promise for ethanol production because, in their early stage of growth, there is very little lignin and the conversion of the cellulose to sugars is more efficient. In addition, the proportion of carbohydrates in the form of cellulose is less than in the mature plant. Since forage crops achieve maximum growth in a relatively short period, they can be harvested as many as four times in one growing season . For this reason, forage crops cut as green chop may have the highest yield of dry material of any storage crop. In addition to cellulose, forage crops contain significant quantities of starch and fermentable sugars which can also be converted to ethanol. The residues from fermentation containing nonfermentable sugars, protein, and other components may be used for livestock feed. The principal characteristics of the feedstock types considered in this section are summarized in Table IV-1. The yield of ethanol from agricultural crops can be estimated if the amount of fermentable components -- sugar, starch, and cellulose -- is known prior to fermentation. If the yield is predicted based on percentages at the time of harvest, then the loss of fermentable solids during storage must be taken into account. This factor can be significant in the case of sugar crops, as discussed earlier. The potential yield of ethanol is roughly one-half pound of ethanol for each pound of sugar. However, not all of the carbohydrate is made available to the yeasts as fermentable sugars, nor do the yeasts convert all of the fermentable sugars to ethanol. Thus, for estimating purposes, the yield of ethanol is roughly one gallon for each 15 pounds of sugar or starch in the crop at the time the material is actually fermented. Because of the many variables in the conversion of liquefied cellulose to fermentable sugar, it is difficult to estimate active ethanol yields from cellulose. The conversion and fermentation of agricultural crops yield products in addition to ethanol and carbon dioxide. For example, even if pure glucose is fermented, some yeast will be grown, and they would represent a coproduct. These coproducts have considerable economic value, but, since they are excellent cultures for microbial contaminants, they may represent a pollutant if dumped onto the land. Therefore, it becomes doubly important that these coproducts be put to good use. Sugar crops, after the sugar has been extracted, yield plant residues which consist mostly of cellulose, unextracted sugar, and protein. Some of this material can be used as livestock feed, although the quantity and quality will vary widely with the particular crop. If the crop is of low feeding value, it may be used as fuel for the ethanol plant. This is commonplace when sugar cane is the feedstock. Sweet sorghum may yield significant quantities of grain (milo), and the plant residue is suitable for silage, which is comparable to corn or sorghum silage except that it has a lower energy value for feeding. Sugar beet pulp from the production of sugar has always been used for livestock feed, as have the tops. Jerusalem artichokes, grown in the Soviet Union on a very large scale, are ensiled and fed to cattle, so the plant residue in this case would be suitable for silage. All of these residues can supply significant amounts of protein and roughage to ruminants. It is evident that all silage production has the potential for the production of significant quantities of ethanol without affecting the present uses or agricultural markets. By planting silage crops of high sugar content and extracting a part of the sugar for the production of ethanol, the ensiled residue satisfies the existing demand for silage. Starch feedstock consists mostly of grains and, to a smaller extent, root crops such as potatoes (white or sweet). The production of nonfermentable material in these root crops is much less than in grains, and the use of the residue is similar. In the case of grains, it is commonplace to cook, ferment, and distill a mash containing the whole grain. The nonfermentable portion then appears in the stillage (the liquid drawn off the bottom of the beer column after stripping off the ethanol). About three-quarters of the nonfermentable material is in suspension in the form of solids ranging from very coarse to very fine texture, and the remainder is in solution in the water. The suspended material may be separated from the liquid and dried. The coarser solids, in this case, are distillers' light grains. The soluble portion may be concentrated to a syrup with from 25% to 45% solids, called distillers' solubles. When dried together with the coarser material, the product is called distillers' dark grains. These nonfermentable solids derived from grain are valuable as high-protein supplements for ruminants in particular. However, if very large quantities of grain are fermented, the great quantity supplied may exceed the demand and lower the prices. Fortunately, the potential demand exceeds the present usage as a protein supplement, since feeding experience has shown that these coproducts can substitute for a significant part of the grain. When the liquid stillage is fed either as it comes from the still or somewhat concentrated, it is especially valuable, since it permits the substitution of straw for a significant proportion of the hay (e.g., alfalfa) normally fed to ruminants. The nonfermentable portion of the grain can also be used as human food. In the wet milling industry, the grain components are normally separated and the oil is extracted. The starch may be processed for a number of uses, or it may be used as feedstock for ethanol production. The gluten (the principal portion of the protein in the grain) may be separated and processed for sale as, for example, vital gluten (from wheat) or corn gluten. As another option, the solids may be sent through the fermenters and the beer still to appear as distillers' grains. Grain processing as practiced in large plants is not feasible for small plants. However, a simple form of processing to produce human food may be feasible. Wheat can be simply processed to separate the starch from the combined germ, gluten, and fiber. They form a cohesive, doughy mass which has long been used as a base for meat-analogs. This material can also be incorporated into bread dough to enhance its nutritional value by increasing the protein, fiber, and vitamin (germ) content. Work at the University of Wisconsin has resulted in the development of a simple, practical processing machine that extracts about 60% of the protein from forage crops in the form of a leaf juice . The protein in the juice can be separated in a dry form to be used as a very high quality human food. The fibrous residue is then in good condition to be hydrolyzed to fermentable sugars. Most of the plant sugars are in the leaf juice and, after separation of the protein, are ready for fermentation. Forage crops have the potential for producing large amounts of ethanol per acre together with large amounts of human-food-grade protein. The protein production potential is conservatively 1,000 pounds per acre, equivalent to 140 bushels per acre of 12%-protein wheat . 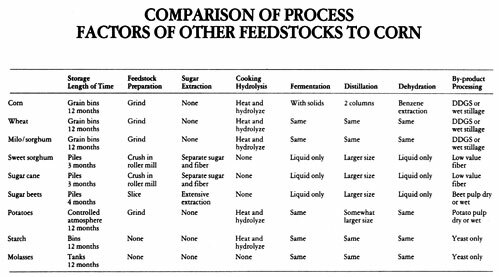 Representative feedstock composition and coproduct yields are given below. Appendix D provides additional information in the table comparing raw materials for ethanol production. As discussed earlier, these data cannot be applied to specific analyses without giving consideration to the variable nature of the composition of the feedstock and the yield per acre of the crop. A simple comparison of potential ethanol yield per acre of various crops will not rank the crops in terms of economic value for production of ethanol. The crops vary considerably in their demands on the soil, demands for water, need for fertilization, susceptibility to disease or insect damage, etc. 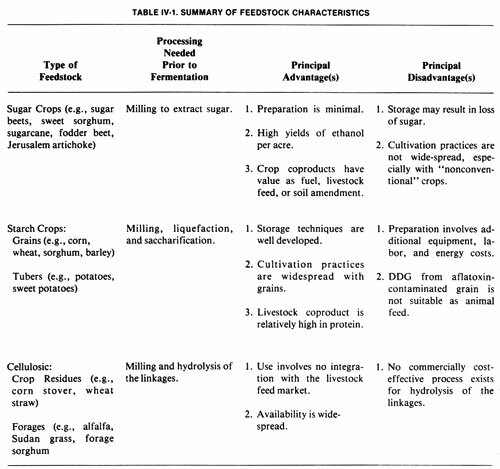 These factors critically influence the economics of producing a crop. Fortunately, forage crops which have the potential for producing large amounts of ethanol per acre have specific agronomic advantages relative to some of the principal grain crops (e.g., corn). The nonfruiting crops, including forage crops, some varieties of high-sugar sorghum, and Jerusalem artichokes, are less susceptible to catastrophic loss (e.g., due to hail, frost, insects, disease, etc. ), and, in fact, are less likely to suffer significant loss of production due to adverse circumstances of any sort than are fruiting crops such as grains. Furthermore, forage crops and Jerusalem artichokes are less demanding in their culture than almost any grain. Their cost of culture is usually lower than for grains on the same farm, and they have great potential for planting on marginal land. It is apparent from the foregoing discussion that the selection of feedstocks for ethanol production will vary from region to region, and even from farm to farm. The results of development work now being carried out will influence choices but, most significantly, the additional choices open to farmers resulting from the opportunity to produce feedstocks for ethanol production from a large variety of crops will alter the patterns of farming. It is not possible to predict what new patterns will evolve. However, it is clear that there will be benefits from the creation of choices in the form of new markets for existing crops and alternative crops for existing markets. In the near future, ethanol is likely to be produced primarily from grain. However, the development of processes for the effective use of other crops should yield results in the near term which could bring about a rapid increase in the use of nongrain feedstocks. 2. Stauffer, MD. ; Chubey, B.B. ; Dorrell, D.G. Jerusalem Artichoke. A publication of Agriculture Canada, Research Station, P. 0. Box 3001, Morden, Manitoba, ROG 1JO, Canada. 1975. 3. Incoll, L.D. ; Neales, T.F. "The Stem as a Temporary Sink before Tuberization." Helianthus Tuberosus L. Journal of Experimental Botany 21. (67); 1970; pp. 469-476. 4. Earl, W.B. ; Brown, W.A. "Alcohol Fuels from Biomass in New Zealand: The Energetics and Economics of Production and Processing." Third International Symposium on Alcohol Fuels Technology. Vol. 1, pp. 1-11. Asilomar, CA; May 28-31, 1979. 5. Linden, J.D. ; Hedrick, W.C.; Moreira, A.R. ; Smith, D.H.; Villet, R.H. Enzymatic Hydrolysis of the Lignocellulosic Component from Vegetative Forage Crops. Paper presented before the Second Symposium on Biotechnology in Energy Production and Conversion; October 3-5, 1979. Available from James C. Linden, Department of Agricultural and Chemical Engineering, Colorado State University, Fort Collins, CO 80523. 6. Besken, K.E. ; et al. "Reducing the Energy Requirements of Plant Juice Protein Production." Paper presented at the 1975 Annual Meeting of the American Society of Agricultural Engineers; paper no. 75-1056, 1975. 7. Mann, H.0. ; et al. "Yield and Quality - Sudan, Sorghum-Sudan, and Pearl Millet Hybrids." Progress Report, Colorado State University, Fort Collins, CO; 1975. Grain. A small plant should be able to use cereal grains. Since grains are commonly stored on farms in large quantity, and since grain-growing farms have the basic equipment for moving the grain out of storage, handling should not be excessively time-consuming. The increasing popularity of storing grain at high moisture content provides advantages since harvesting can be done earlier and grain drying can be avoided. When stored as whole grain, the handling requirements are identical to those of dry grain. If the grain is ground and stored in a bunker, the handling involves additional labor since it must be removed from the bunker and loaded into a grainery from which it can be fed by an auger into the cooker. This operation probably could be performed once each week, so the grains need not be ground daily as with whole grain. Roots and tubers. Potatoes, sugar beets, fodder beets, and Jerusalem artichokes are generally stored whole in cool, dry locations to inhibit spontaneous fermentation by the bacteria present. The juice from the last three can be extracted but it can only be stored for long periods of time at very high sugar concentrations. This requires expensive evaporation equipment and large storage tanks. Belt conveyors will suffice for handling these root crops and tubers. Cleaning equipment should be provided to prevent dirt and rocks from building up in the fermentation plant. Sugar Crops. Stalks from sugar cane, sweet sorghum, and Jerusalem artichokes cannot be stored for long periods of time at high moisture content. Drying generally causes some loss of sugar. Field drying has not been successful in warm climates for sugarcane and sweet sorghum. Work is being conducted in field drying for sweet sorghum in cooler climates; results are encouraging though no conclusions can be drawn yet. Canes or stalks are generally baled and the cut ends and cuts from leaf stripping are seared to prevent loss of juice. A large volume of material is required to produce a relatively small amount of sugar, thus a large amount of storage space is necessary. Handling is accomplished with loaders or bale movers.